Paris, France; Shrublands, South of England, UK; MI6 HQ, London, UK; Nassau, Bahamas; Miami, USA. Bond is observing a widow paying her respects at her dead husband's funeral. The woman gets into a car and goes home, however Bond gets there first and is waiting for her. It turns out that the woman is actually the supposedly dead enemy agent Jacques Boitier in disguise. A brutal fight ensues with 007 the victor, and he escapes the scene using a jet pack. After his brief flight across the chateaux, Bond lands next to his Aston Martin and female accomplice. After stashing the pack in the back of the car they leave shooting water out from under the bumper at their pursuers. 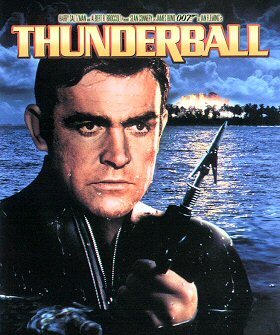 Thunderball is the MI6 codename given to the mission to foil SPECTRE's plans by recovering the nuclear warheads and avoid paying the ransom. It is marked on the assignment folders as well as being mentioned by M to Bond. Bond: "That looks like a woman's gun." Largo: "Do you know a lot about guns, Mr Bond?" Bond's jet pack proves to be too big for the boot of the Aston Martin. It is the only film in which all the Double-O's are seen together. An underwater scene featuring Bond and Domino making love behind a rock was on the request of Cubby Broccoli who considered it a little too suggestive - it featured a huge explosion of bubbles rising to the surface, followed by Domino's bathing costume. A scene shot but not used featured Domino showing around Bond on the Disco Volante. According to the documentary on the DVD special edition, the footage is presumably lost, but a few rare publicity stills remain. The UK cinema release was cut to receive an "A" rating, but all video releases were uncut. In different versions, Bond says a different line when he escapes from Largo's shark pool. Some versions also feature a comment that Felix makes when he and Bond see a manta-ray from the helicopter. There are also alternate takes of a scene with Largo on his boat in different versions. In the trailer for the film, Bond says the line, "The things I do for England." The line was cut from the final version of the film, and then used in the next Bond film, You Only Live Twice. Further details on alternate versions of "Thunderball" can be found on the Release History page. James Bond will return in "You Only Live Twice".